Our most effective, best selling additive. Citrus Solv is a must whenever you face the toughest cleaning situations. 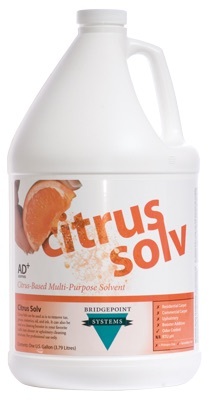 Made from citrus solvents, Citrus Solv is 100% active! That means no carriers or fillers, just the most powerful citrus solvent cleaning additive on the market! This is the closest thing to a miracle chemical. Use Citrus Solv as an additive to pre-sprays at just 1 to 2 oz. per diluted gallon to cut through the worst greasy, oily soils and avoid re-spraying or over scrubbing and over wetting traffic lanes. Add it to your presprays or emulsifiers (use only in solvent resistant equipment) to make them more effective. There's a reason it's so popular! Also leaves a wonderful orange scent behind!